Options & Main Menu: Both are good. Music: It’s different for each room – the Blues Music is good. But it’s a little annoying generally so I advise you turn the volume down. Hints: Compass (Arrow points direction of Items); Camera; Thermometer – be careful as you can accidentally click on these. Extras: Concept Art; Soundtracks; Strategy Guide; Wallpapers; Bonus Levels to unlock after the main game. 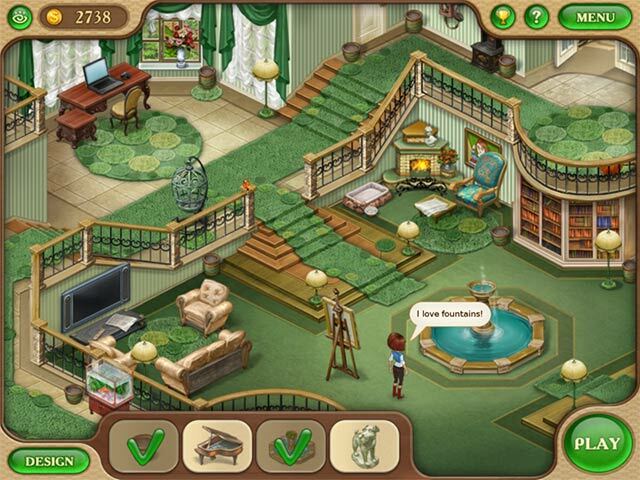 Bonus Levels: Barbeque; Billiard Run; Hall of Fame; Outdoor Fountain; Bar; Veranda; Old Attic; Living Room. Desktop: (Top Left) Eye (Overview), Coins; (Top Right) Achievements, Help, Menu. (Bottom Left) Design; ( Left Centre) Design Items; Bottom Right) Play. 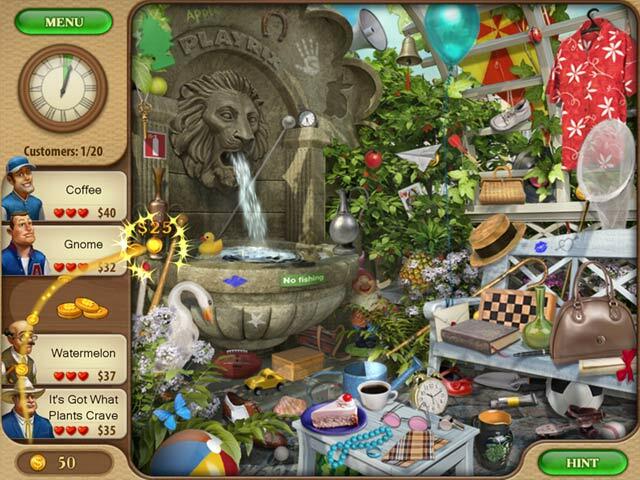 HOP SCREEN: (Top Left) Menu; (Left Side) Customer/HOP Item list various forms, Coin Collection; (Right) Hint. Tutorial: Automatic but can be turned off. Graphics: Colourful and relevant, but I wish they were a little clearer. Play Modes: Relaxed; Against the Clock. Puzzles: Easy, enjoyable, and all to do with getting Manor in order – like switching on power. HOPs: Pictures; Shapes; Lists; Torch-lit; Swap Items. Game-play: With the Cursor, brush over the coins collecting at the side to bank them on the top bar, and to release the spaces for more Items. Renovation selections are now 5 choices of decor items to purchase with your collected coins – including Art Deco. Player Participation: As with these games that is fairly continual, and enjoyable. Satisfaction Factor: Initially good, but once the main game was completed this nose-dived to very poor satisfaction. Frustration Factors: The Collector’s Edition is a real let-down. Game characteristics, that were part of the main game in previous PlayRix Games e.g. MANSION MAKEOVER, are how separated into Standard and Collector’s Edition so you pay more for what should have been one Standard game. Not only is this unfair, there is actually quite a lot less to play, with no extra Renovations to do on the house or the characters involved. I still recommend this game to those who enjoy Renovation Games, but be warned about the so called Extras. There is a MANOR MEMOIRS Standard version but I don’t know what you get in that, with half the game relegated to the Collector’s Edition.. 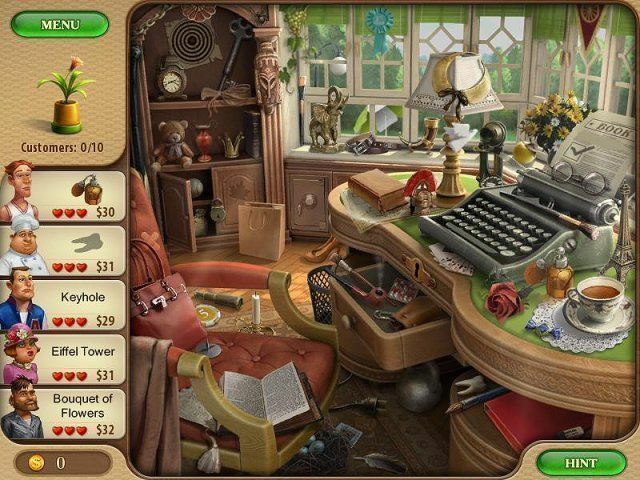 This entry was posted in FAMILY GAMES and tagged Big Fish Games, Games; Reviews, Hidden Object Games, Jud, Manor Memoirs Collector's Edition, Playrix Entertainment, Point & Click, Renovation Game. Bookmark the permalink.